Who We Are — Brown Dog Coalition & Rescue Ltd.
Our Mission: To help one dog at a time. To evaluate, transport, and rehome companion animals to approved rescues and adopters. To assist homeless animals with their medical care, spay/neuter, and general welfare and in general give dogs and cats a higher chance of being adopted into appropriate homes. To promote the adoption of homeless animals and encourage spay and neuter through education and life saving programs. Naomi retired in 2013 from a software company and began her philanthropic effort to help dogs. She formalized her work by cofounding the non-profit, Brown Dog Coalition, in June of 2015 alongside her daughter, Annie. She lives outside of Boston, Massachusetts with her husband and a brown dog of her very own named Libby who was rescued in Indiana. Naomi is a persistent leader who tirelessly pursues her mission. Annie became fixated on helping dogs after seeing Lady and the Tramp at a very young and impressionable age. She has a hand in everything from marketing to fundraising to fostering to coordinating adoption days. She is a jack of all trades with a specialty in dog-petting. Annie adopted her sidekick, Freckle, in July 2017 and they have been inseparable since. Katie memorized the encyclopedia of dog breeds when she was 10. She now lives in NYC and by day she works at a post-production company but by night she creates graphics, flyers and other content for Brown Dog. She and her partner adopted their dog daughters, Peach and Roo, in March 2018. All of them are vision impaired, but the humans wear glasses. 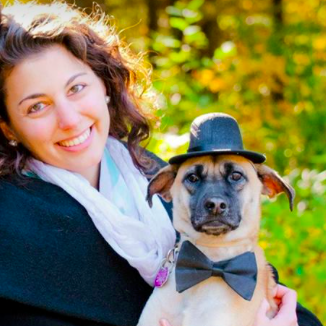 Dr. Tabbah graduated from Tufts Veterinary School in 2014. Her professional interests include preventative medicine, shelter medicine, and surgery. Dr. Tabbah has adopted both of her dogs through BDC—Monty, a three-legged brown dog, and Maddie, a puppy parvovirus survivor. In her spare time, Dr. Tabbah enjoys spending time outdoors hiking with Monty and Maddie or reading a good book. Val has been a lifelong animal advocate for all creatures. While living in Atlanta, she and Robin became aware of the plight of stray dogs, picking up several off the side of the road to rehabilitate and rehome. Since then, volunteering with rescued dogs has become an integral part of life. Fostering and/or adopting a dog who otherwise wouldn’t have a chance is a great joy! She lives with her three rescued dogs Nellie, NayNays and Oreo, a household of cats, and a variable number of fosters. Robin does it all. From being a nurse, to teaching work-out classes, to helping out at adoption days and more—Robin is like that pink bunny with a drum. She spends her free moments taking rescued dogs, Nellie, NayNays and Oreo, on hikes and adventures. After more than a decade of various volunteer roles in animal rescue, Jennifer now specializes in dog photography. She captures the adorable in every dog and helps Brown Dogs get adopted through her eye-catching photography. Jennifer enjoys fostering dogs, sometimes a few at a time, and by the time they are adopted, many have full modeling portfolios. Her childhood dream was to help animals, and being a part of Brown Dog has helped fulfill that. Lindsey is a mother of four: two human and two canine (all girls). She is a dog foster extraordinaire, coffee queen, and ultimate cool mom. Her role within Brown Dog has quickly expanded since she joined our team in 2018, and she now manages our email check-ins and paperwork at adoption events. In 2007, after Debby retired from her career as a kindergarten teacher and then an interior decorator, she began her journey with animal rescue by meeting a very sick puppy and promising him she would care for him and find him a home. Little did she know, that sick puppy would find his forever home with her own family. Since that first rescue, Debby and her husband have been involved with animal welfare—to them, the most rewarding experience is seeing hope reignite in a dog’s eyes. Lauren's family jokes that she could bark before she could talk. After adopting her right-hand man, Brooks, in 2015, Lauren set out to learn all she could about animal rescue and the overpopulation problem by moving to Alabama. Lauren now does everything from dog assessments to paperwork to fostering lots and lots of dogs. She has a soft spot for shy and frightened dogs, so when she met a feral dog named Winnie in 2017, her family of two became three. When she isn't at the shelter or dressing her foster dogs up in this season's latest fashions, she works full-time at a bank.